Alexandria Square at 2nd and Brown Streets in Napa suffered extensive damage in 6.0 magnitude earthquake on Sunday, August 24, 2014. AMERICAN CANYON, Calif. (KGO) -- The largest earthquake to hit the Bay Area since Loma Prieta rocked the region almost 25 years ago sent scores of people to hospitals, ignited fires, damaged multiple historic buildings and knocked out power to thousands of homes and businesses in California's wine country on Sunday. According to the U.S. Geological Survey, the magnitude-6.0 earthquake struck at 3:20 a.m. Sunday, about three miles northwest of American Canyon. Queen of the Valley Medical Center reports that 211 patients were treated in the aftermath of the quake. Queen of the Valley Medical Center reports that of the 211 patients who were treated in the aftermath of the Napa Valley Quake. Hospital spokesperson Walt Mickens reports that 12 patients were admitted. Seven had orthopedic issues and five were treated for respiratory and cardiac conditions. One is still in the hospital in critical condition. The bulk of patients have been treated and released. Two triage tents that were set up will be taken down later Sunday evening and the hospital will soon be getting back to normal operations. Mickens reports that a 13-year-old was brought in and stabilized before being airlifted to another hospital. The teen was injured when pieces of a fireplace fell down on him. He is now being treated at the University of California, Davis Medical Center and is in serious condition. Other serious injuries involved broken bones and other trauma. Mickens says the rest included "mostly lacerations, bumps and bruises" and those patients have been treated and released. Hospital staff said early Sunday evening that they were starting to see a slowdown in the number of patients seeking treatment for earthquake-related injuries. 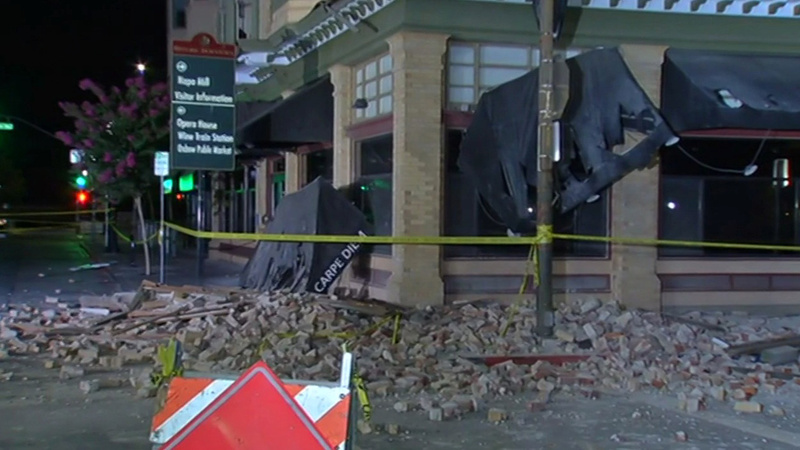 Several buildings in Napa sustained major damage during the 6.0 earthquake that hit near American Canyon early Sunday morning. 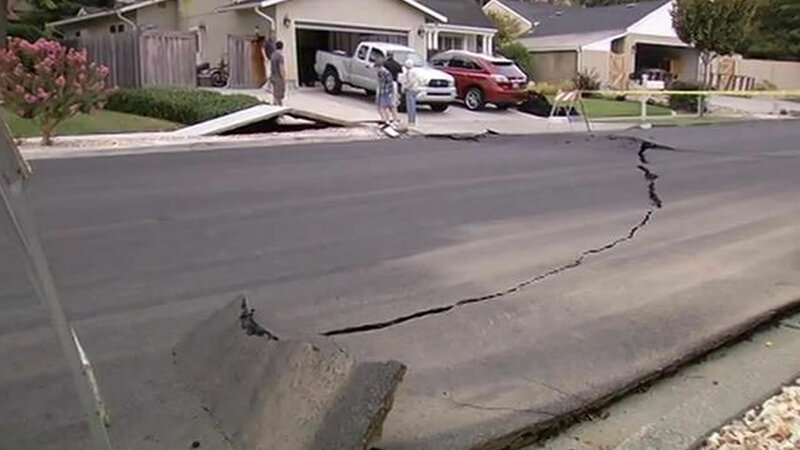 The Red Cross reports that two shelters are open for those affected by the quakes at Crosswalk Community Church at 2590 First St. in Napa and Florence Douglas Center at 333 Amador St. in Vallejo. Some 30 families and 83 people are staying at the Crosswalk Community Church. All Napa Valley Unified School District campuses will be closed Monday. Justin Siena High School will also be closed. A decision on if schools will reopen on Tuesday will be made at 1 p.m. on Monday. 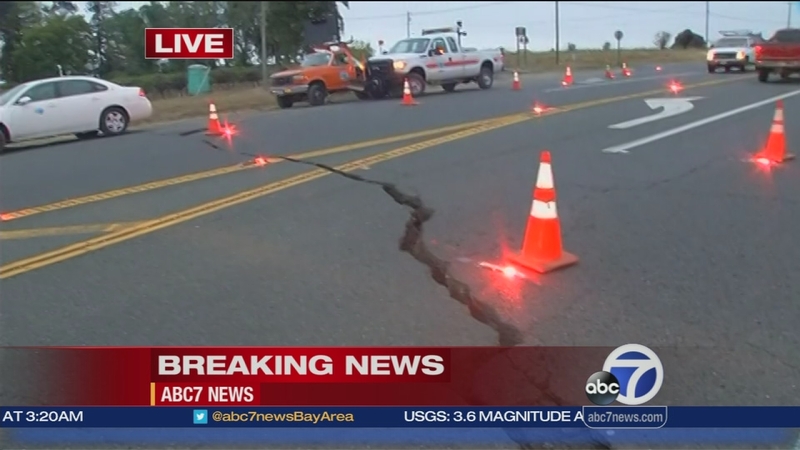 Governor Jerry Brown declared a state of emergency due to the damage resulting from the 6.0-magnitude earthquake centered in southern Napa County. The governor includes power outages to 69,000 area residents, continued aftershocks, and fires as additional reasons for this morning's emergency declaration. The declaration allows all available state resources to be directed toward earthquake response efforts. 6.0 magnitude earthquake near American Canyon felt all over the Bay Area. In a statement issued Sunday morning, he said: "My Office of Emergency Services has been on full activation since early this morning and is working close with state and local emergency managers, first responders and transportation officials to respond to impacts to residents and critical infrastructure. These safety officials are doing all they can to help residents and those living in affected areas should follow their guidance and instruction." Napa city officials provided an update Sunday afternoon on damage to the local infrastructure from the quake. Jacques LaRochelle, the director of Napa's Public Works Department, says 61 water mains broke as a result of the earthquake, although all were smaller distribution lines rather than the larger transmission lines. According to LaRochelle, about 20 of the water main breaks have been isolated and that it could take crews up to a week to make repairs and restore water service to all customers. He said water stations will be provided for residents in the meantime. He adds that the city's "roads aren't too bad. We have a few locations with buckling streets, but nothing that's serious enough to cause us to close the road." Rep. Mike Thompson, D-Napa, also attended Sunday afternoon's news conference and detailed some of the damage to Napa's wineries, one of the city's main tourist industries. 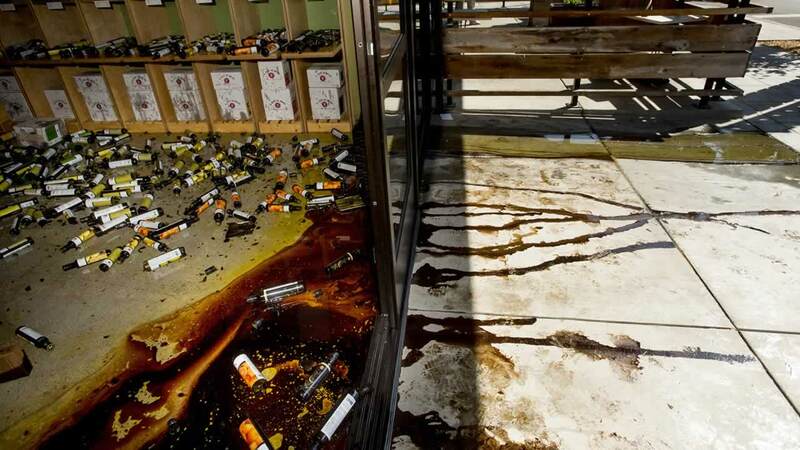 "Some wineries have been hit pretty hard, with barrels knocked off the rack and glassware shattering," Thompson said. He said federal agencies have conducted an aerial survey of the region but do not yet know exactly how much damage was wrought by the quake. Napa City Manager Mike Parness said 33 buildings have been red-tagged, meaning occupancy won't be allowed until repairs are made. Three of those buildings are at 816-820 Brown St., which are unreinforced masonry buildings that had not been brought up to current seismic codes, Parness said. Several other buildings have been yellow-tagged, allowing limited access, he said. 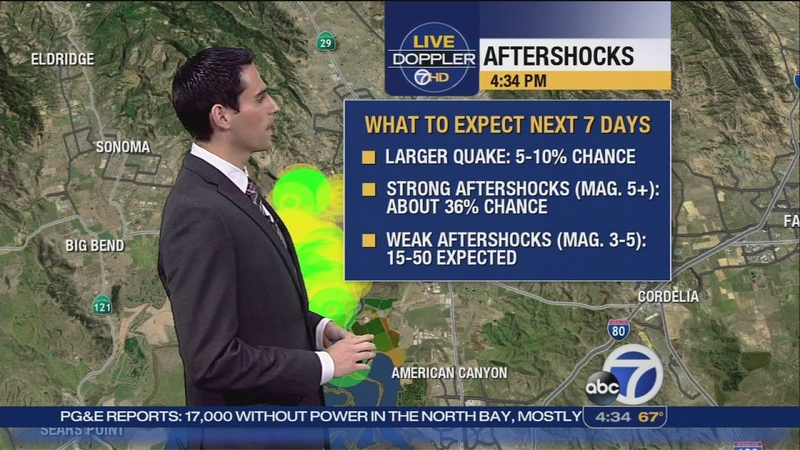 Strong to moderate aftershocks are expected over the next seven days following a major 6.1 magnitude quake in Napa early Sunday morning. Napa Fire Department Operations Chief John Callanan said the city has exhausted its own resources trying to extinguish six fires after the water mains broke or leaked; transporting injured residents; searching homes for anyone who might be trapped; and responding to reports of 50 gas leaks. 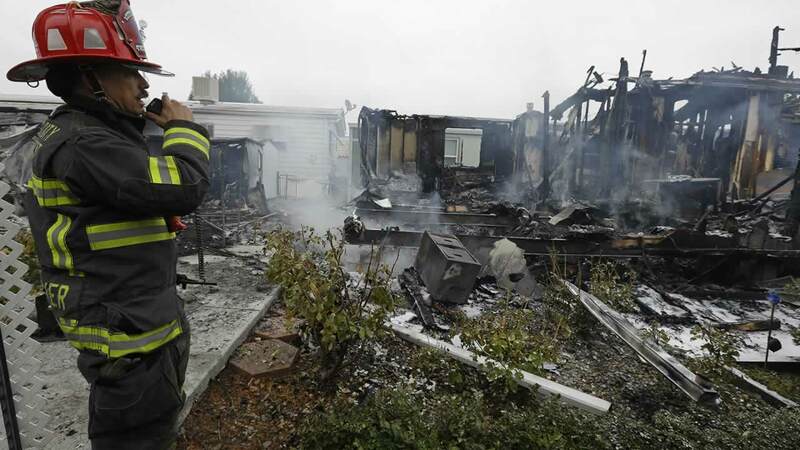 Two of the fires happened at mobile home parks, including one where four homes were destroyed and two others damaged, Callanan said. A ruptured water main there delayed efforts to fight the blaze until pumper trucks could be brought in, he said. A fire destroyed four homes and damaged several others at a mobile home park on Orchard Ave. in Napa following a 6.0 quake early Sunday morning. Nola Rawlins, 83, was one of the Napa Valley Mobile Home Park residents rendered homeless by fire. Rawlins said she was awakened by an explosion right after the quake and managed to escape unharmed, but lost all her belongings. "There were some explosions and it was burning. Everybody was out in the street," she said. "I couldn't get back in the house because they told everybody to go down to the clubhouse, so I didn't get anything out of the house." Vallejo police are reporting isolated structure damage to downtown buildings and on Mare Island. Police are also reporting water outages from water main breaks, minor roadway damage, minor gas leaks and power outages. 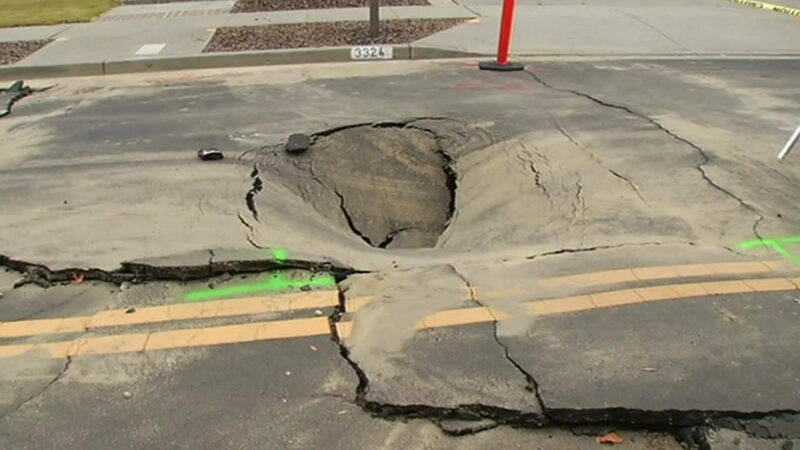 A road near Highway 121 in Napa sustained major damage during the 6.1 quake. There have been no reports of damage to roadways in the South Bay, Peninsula, East Bay, or San Francisco. CHP officers are currently checking roads for obvious damage. The popular Napa Valley Wine Train cancelled operations Sunday in order to inspect their trains. An official for the train company says they expect to resume operations on Monday. Amtrak's Capitol Corridor train service has been temporarily suspended this morning between Sacramento and San Jose while crews inspect the tracks for damage. ACE special train service between Stockton and San Jose for this afternoon's San Francisco 49ers football game at Levi's Stadium in Santa Clara has also been canceled because of safety concerns following the quake. Caltrain officials said they expect to run service to the football game but said there are delays this morning because of track and bridge inspections. BART had pre-planned delays because of track maintenance on its Pittsburg-Bay Point line but has not reported any other disruptions Sunday morning as a result of the quake. Six Flags Discovery Kingdom was open on Sunday. In a statement, spokesperson Nancy Chan said: "The park is currently undergoing a thorough inspection and preliminarily, the park has not sustained any damage or power outages from the earthquake. All of the animals were immediately checked out and found to be fine. The park will open as originally scheduled today." Law enforcement and emergency agencies across the Bay Area are asking residents not to call 911 unless they have an emergency. * Check for damage, especially to utilities, foundation, walls, and chimneys. * If you smell or hear leaking gas, open your windows and get everyone out of the building right away. Turn off gas at service (if residential) and notify PG&E immediately. Customers can contact PG&E at www.pge.com or call 1-800-PGE-5002. * If you smell smoke, get everyone out of the building. Use a fire extinguisher to put out small fires. Don't use water on electrical or gas fires. * Inspect your home's foundation, walls, and chimneys. Look and listen for any signs of possible collapse. * Please be patient if your power is out. Utility providers are working to restore services. For more information or assistance please contact PG&E. * If you are experiencing low water pressure or interrupted water service please contact your local water provider. * Aftershocks could be possible. * If the shaking starts again, protect yourself by staying away from windows and taking cover in a door frame or under a sturdy piece of furniture. * If you are outdoors, stay in the open away from buildings, bridges, signs and overhead wires. * Remain calm and do an assessment of those in your building and on your block if it is safe to do so. Bay City News and the Associated Press contributed to this report.